The setting was four years after the second film (or eight years after the first film). In the film's prologue set about 8 weeks before the events in the film, 12 year-old Eric (Trevor Morgan) and an adult family friend Ben Hildebrand (Mark Harelik) were para-sailing near Isla Sorna 207 miles west of Costa Rica. When their boat was overcome by fog and the crew disappeared, they unclipped their jerking parasail when their boat was headed for a crash on a rocky crag - and then sailed toward the island itself. In Montana during a dig with his apprentice-assistant Billy Brennan (Alessandro Nivola), paleontologist researcher Dr. Alan Grant (Sam Neill), a velociraptor specialist (who studied evidence of the creatures' intelligence), was approached by adventurer-traveler Paul Kirby (William H. Macy) and his 'wife' Amanda (Tea Leoni) to guide their aerial tour of quarantined Site B -- Isla Sorna. Kirby claimed he was from Kirby Enterprises and had a "proposition" - he would lavishly fund Grant's research ("What's it gonna take?") in exchange for Grant's reluctant participation ("No force on Earth or heaven could get me on that island"). After their chartered tour over the "no-fly zone," Kirby landed the plane, against Grant's wishes (who was knocked out), and his three mercenaries and wife revealed they were there "looking for someone." The group was attacked by a giant superpredatory Spinosaurus Aegypticus that killed two of the three mercenaries: Cooper (John Diehl), who was standing on the runway in the flight path - was snatched and devoured as the plane attempted to take off, and after the plane crashed and ended up in tall treetops ("We haven't landed yet"), pilot Nash (Bruce A. Young) was chewed up and stomped upon. The disintegrating plane was further assaulted like a rolling tin can by the creature as they fled deeper into the forest. The survivors were further pursued by another predatory Tyrannosaurus Rex that was distracted in its battle with the Spinosaurus. The truth came out: Kirby and Amanda were a divorced couple searching for their son Eric and Amanda's boyfriend Ben (from the film's opening scene). Paul owned Kirby Paint & Tile Plus Company in the Westgate Shopping Center in Enid, Oklahoma and was only posing as a wealthy businessman. During their trek to the coast, the group found the duo's crashed parasail, a life preserver, Amanda's phone (showing proof that Eric had survived) and Ben's skeletal remains (Amanda cried: "Our baby's out here all by himself"). When they found the old InGen compound (a major hatchery for raptors), the third mercenary (or "booking agent") Udesky (Michael Jeter) was killed by a fierce raptor attack (the raptors exhibited pack teamwork, trickery and "cawing" communication). After he was separated from the group, Grant was rescued from raptors by Eric, who threw a gas grenade at them - he had resourcefully survived and lived on the island in an overturned water truck. It was revealed that Billy's theft of raptor eggs had helped provoke some of the previous attacks. In their retreat to a boat dock, the group passed through an aviary bird-cage/dome filled with threatening flying Pteranodons. Eric was snatched, but saved by parasailing Billy, who then disappeared and was presumed dead. Their satellite phone which had been consumed earlier by the Spinosaurus, was found in a large pile of dinosaur poop - enabling one phone call to Dr. Ellie Sattler (Laura Dern), now mother of two, for rescue: "The river. Site B!," while they fought off the Spinosaurus with fire from ignited gasoline. The raptors retrieved their two stolen eggs and then retreated just before the group was rescued by a contingent of US Marines that landed on a beach in a helicopter (with US Navy support offshore). A wounded Billy had already been rescued and was onboard. Three flying Pteranodons were seen gliding into the sunset away from the island as the film ended ..."just looking for new nesting grounds." This second sequel was essentially a non-stop action-chase film. 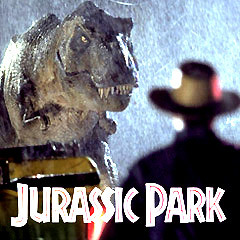 The first of the film series' scripts that was not based on a novel by the original author Michael Crichton. No Academy Awards nominations. Also nominated for a Razzie Award for "Worst Remake or Sequel." With a production budget of $93 million, and box-office gross receipts of $181 million (domestic) and $369 million (worldwide). Set-pieces: the plane crash, the dinosaur stampede, the Pteranodon attack in the aviary, the final Spinosaurus attack on the ferry boat.